L-R: Kayla McLeod, Justice Mabry, Ismael Sy Savane, Gabrielle Oti, Kelvin Jennings, Suneil Jeter, Mame Seck, Sydney McLeod, Moctar Fall, Aida Bathily, Michel Sidemion, Noumoutche Fanny, Briannie Bratcher, Hazel Murray, Lexi Torres, Elyjah Pellew. Photo credit: Rafael Infante. 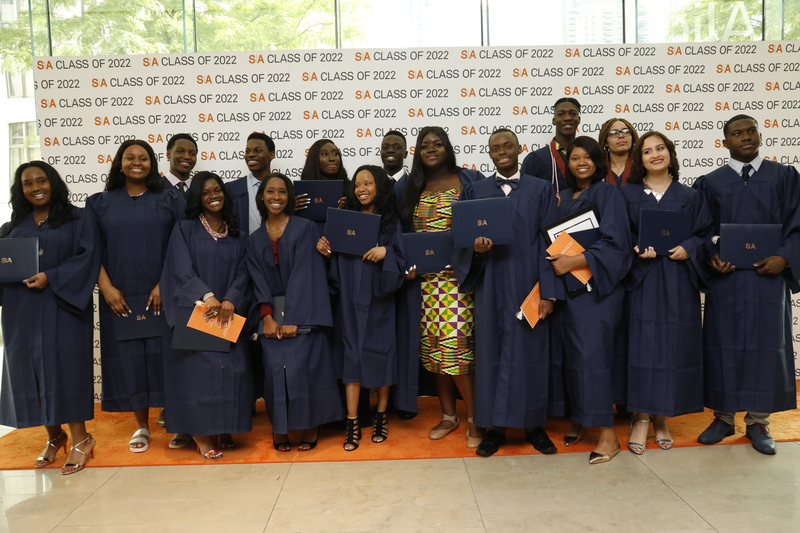 The pioneering class of Success Academy scholars, who began their journey in the network’s first elementary school on 118th Street in Harlem in 2006, graduated Thursday with stellar college plans. All 16 seniors have been accepted to four-year colleges, most of which are ranked as selective or highly selective. They include MIT, Tufts University, Emory University and the University of Southern California. Generous financial packages will mean that almost all families will pay little to nothing for their children’s higher education. Institutional and federal aid awarded totals more than $855,600 for the coming year. Prominent business executive Ursula M. Burns, who as the former CEO of Xerox was the first black woman to head a Fortune 500 company, gave the Commencement Address at the ceremony at Lincoln Center’s Alice Tully Hall. The audience of nearly 1,000 included jubilant families, educators from across the network’s 46 schools, board members and long-time supporters. Eva Moskowitz, founder and CEO of Success Academy Charter Schools, praised the scholars’ trajectory. “Today, we are sending you out into the world, with the expectations that you will use the education you have been afforded,” she said. “I want you to work hard in college and know that achievement will always follow, to set ambitious goals and pursue excellence, and to prize leadership, so you do not follow but lead the way. From a single elementary school in Harlem, Success Academy has grown to a network serving 15,000 scholars across Manhattan, the Bronx, Brooklyn and Queens. Seniors attended Success Academy High School of the Liberal Arts on East 33rd Street in Manhattan. The seniors said they will draw on the determination they learned in high school as they approach the rigors of college. Success Academy educates as many students as New York State’s seventh-largest school district and outperforms every other district in the state: 95% of Success scholars passed math and 84% passed English exams last year. On the SAT exams, the graduating class collectively scored in the 88th percentile. The high school is distinguished by a rigorous curriculum and robust programs in chess, debate, art, music, dance and athletics. Before the graduation ceremony, on Thursday morning, Success seniors visited the school where it all began on West 118th Street. They were entertained by special song and dance performances the younger scholars had prepared. Third- and fourth-graders interviewed the seniors about their journeys to graduation and college acceptance, and the seniors received freshman survival kits, with laundry bags and candy bars to take with them to campus. Then, the seniors took one last walk of the hallways to emerge through a cheer tunnel made up of Success faculty and younger scholars.